Thanks to all of you, we’ve managed to raise almost 50% (over 200k!) towards our goal in just over a week! In addition, we’ve also been GREENLIT on Steam!! This means that all tiers starting with Guardian Sheepdog ($40) and above now grant access to the closed beta of Them’s Fightin’ Herds! We couldn’t have even hoped to accomplish any of this without your love and support. Thank you from the bottom of our hearts! We really appreciate everyone for helping to spread the word of our Indiegogo campaign. In fact, we’ve been so impressed that we want to reward those who have helped spread the word by providing referral prizes. The person that raises the most out of referrals will get everything in the Custodian of Worlds ($5000) tier AND the unique, one and only ‘Golden Super Toot’ lobby item that does cool stuff for everyone in the lobby. 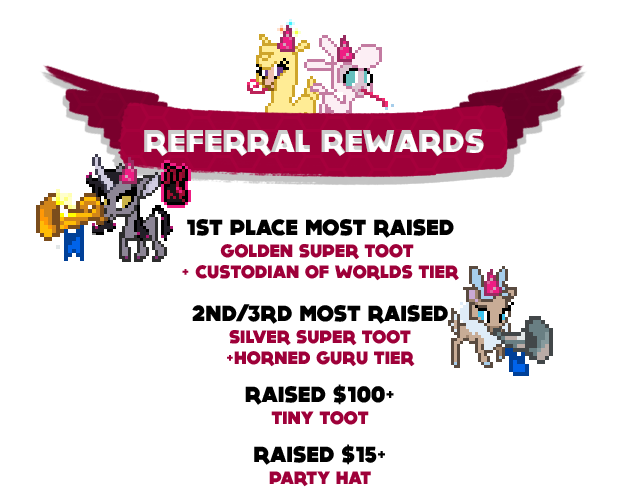 The second and third to raise the most out of referrals will receive the Horned Guru ($500) tier as well as one of only two ‘Silver Super Toot’ that do cool stuff for everyone nearby. But that’s not all, Fœnicians. Everyone who raises at least $100 in referrals (including our grand winners) will get the exclusive ‘Tiny Toot’ lobby item. And everyone that raises at least $15 will receive the (also exclusive) ‘Launch Party Hat’ lobby item, just what you need to party out during launch day. Note that you must have backed a tier that includes the game for you to be able to receive in-game prizes. share the campaign directly using the buttons on the left or copy the unique URL you get by clicking the “Link” button. refer our Indiegogo campaign with anyone that you think would be interested in Them’s Fightin’ Herds! A lot of you have already referred a lot of people, and all of those still count for this contest! You can check the number of referrals and amount referred in your Indiegogo profile. The referral contest lasts until the end of the crowdfund. Click here for some more details. 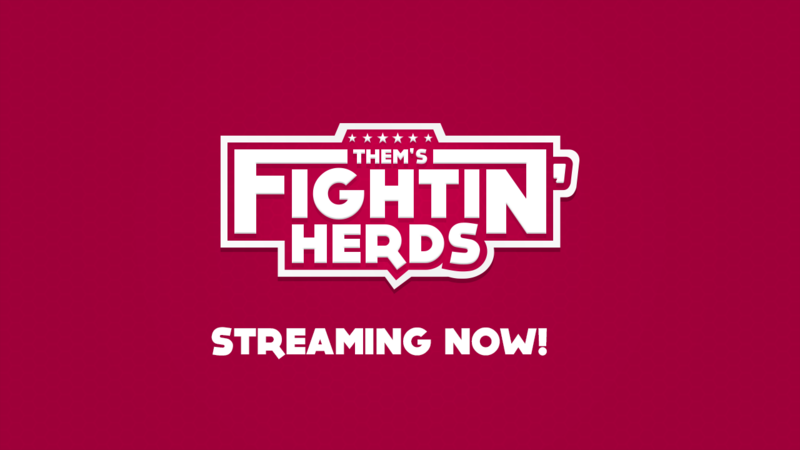 We’d also like to announce that we’ll be streaming some of Them’s Fightin’ Herds tomorrow! During the stream we’ll show a bit of our development process, some gameplay, and a sneak peak at Oleander and Paprika in their early (EARLY) stages of development. Come join us for the stream on Fri 7pm EST / 4pm PST on our twitch channel.